TNR -- TV News and Reviews: Say Yes to the Dress -- How Vain Can You Go? Say Yes to the Dress -- How Vain Can You Go? Tonight's episode of Say Yes to the Dress, "Hot Dresses, Cold Feet", had me wondering: how important is personal vanity in relation to the rest of your wedding? Most of this particular Say Yes to the Dress episode focused on brides who found and fell in love with dresses that were drastically out of their price range. This is the sort of thing that happens all the time in life. You set a budget for a house, but when you start looking at the houses in that price range, you realize you're going to have to spend more to get what you want. Same with cars, or shoes, or appliances. The one thing they all have in common, however, is that they last (hopefully) a long time. So if you spend a little more than you'd planned, it's worth it if it means you'll be happier and have something of higher quality that lasts a lot longer. You could wear those shoes for five years, drive that car for ten, and live in that house for 30 years. But a wedding dress? It's for one day. As one bride put it, her $6000 dress means she would be spending $1000 an hour for a dress. If you're a model or actress and make a $1000 an hour, this might not be a big deal. But many of the brides on Say Yes to the Dress are people of simple means. Is it worth putting your parents in debt for ten years just so you can have a designer wedding gown? Is your vanity that important? Luckily this woman felt $3000 over budget was not the right move. Another bride, however, chose a dress that was $1200 over her original budget. Her mother said she'd work three jobs if she had to to get the dress. The voiceover told us that her mother walked to work every day instead of taking public transportation to help pay for the dress. Seriously? You made your mother, who raised you, and gave you everything, walk to work (surely a good distance if she was taking public transportation before)--just so you can have the dress the salesperson talked you into? Of course often the parents on Say Yes to the Dress are the enablers, encouraging the brides that they deserve "whatever they want". Yes, it's nice that parents love their children and want them to be happy. But it doesn't serve them well in life if they think it's okay to put everyone else in financial jeopardy just so they can get what they want. Some of the Kleinfelds consultants told one of the brides to just take the cash out of the rest of the wedding--skimp on the flowers, the menu, or invite less guests. That's right Aunt Ruth, you're not invited to the wedding because the bride wanted a more expensive dress. Really, how vain can you go? Say Yes to the Dress airs on TLC Friday nights at 10/9c. 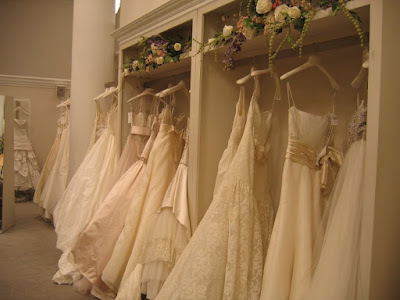 PHOTO: Dresses at Kleinfelds bridal salon, Say Yes to the Dress, c2009 Discovery Travel and Living. I do not and never have understood spending literally thousands for a wedding dress. You can get a car for that (and it will be a lot more useful). When I got married the first time, I spent about $300 on my dress, maybe a bit less. I made it myself. True, that won't work for everyone, but it was gorgeous when I was done, something that would mean more to my daughter than anything, no matter how costly, I could buy at a store. I can't understand the selfishness that would put parents (or oneself) in the poorhouse to have "the perfect" dress for one day. I know, Stephanie, I don't understand it either. And I honestly think the average groom is going to love the bride and think she's beautiful no matter what she's wearing. Everyone wants to look beautiful on their wedding day, but there's no reason to put yourself or your parents in the poorhouse for a day that's supposed to be about committing to the person you love. Just a sidenote, the mother of my bridesmaid made all the bridesmaid dresses. Even if you don't have the skills to make your own wedding dress (and I didn't know I did until I did it), you might know or could find someone with the skills without putting yourself in the poorhouse. Law & Order: Criminal Intent -- "Rock Star"